(Macao, Nov. 16, 2018) – The festive season officially kicked off yesterday at Sands Resorts Macao with The Venetian Macao and The Parisian Macao transformed into enchanting winter wonderlands, complete with spectacular Christmas trees, a genuine ice skating rink, fun markets, superb entertainment and delicious food and drink treats. Guests and visitors alike can enjoy the celebrations right through until Jan. 6, 2019. The highlight of the launch event was the official unveiling of the stunning 50-foot inverted Christmas tree which hangs from the ceiling in the lobby rotunda of The Parisian Macao by Dr. Wilfred Wong, President of Sands China Ltd., and Mr. Cheng Wai Tong, Deputy Director of Macao Government Tourism Office, which is supporting the Winter Extravaganza programme. The magnificent tree was inspired by the one at the renowned Galerie Lafayette department store in Paris and will certainly be popular for selfies and photographs this festive season. Guests were also able to enjoy The Eiffel Tower’s Grand Illumination Show Christmas Edition light performance which runs until Dec. 30, 2018 and the Winter in Paris activities including twinkling tree decorations, lights and festive reindeer, along with a real ice skating rink at The Eiffel Tower Level 7 observation deck, where they could try skating and special winter themed cuisine. The ice rink will also be available until Jan. 6, 2019, from 4-10 p.m.
Another spectacular 50-foot tree was unveiled by Ruth Boston, Senior Vice President, Marketing and Brand Management, Sands China Ltd., at The Venetian Macao’s lagoon area. At The Venetian Macao visitors enjoyed the Winter in Venice decorations, including the beautiful Christmas train ‘The Venetian Express’ which welcomed visitors, along with a Christmas themed parade and entertainment and of course a special visit from Santa Claus. Children of all ages can come to meet Santa and have their picture taken with him in his grotto. Earlier in the day at St. Mark’s Square at Shoppes at Venetian an activation ceremony saw the unveiling of the stunning Longines Christmas tree surrounded with unique surprises including a beautifully crafted flying horse, with actress and Longines Ambassador of Elegance Ms. Chiling Lin in attendance. To learn more about festive season events at Sands Resorts Macao, please visit SandsResortsMacao.com/MagicalWinter. 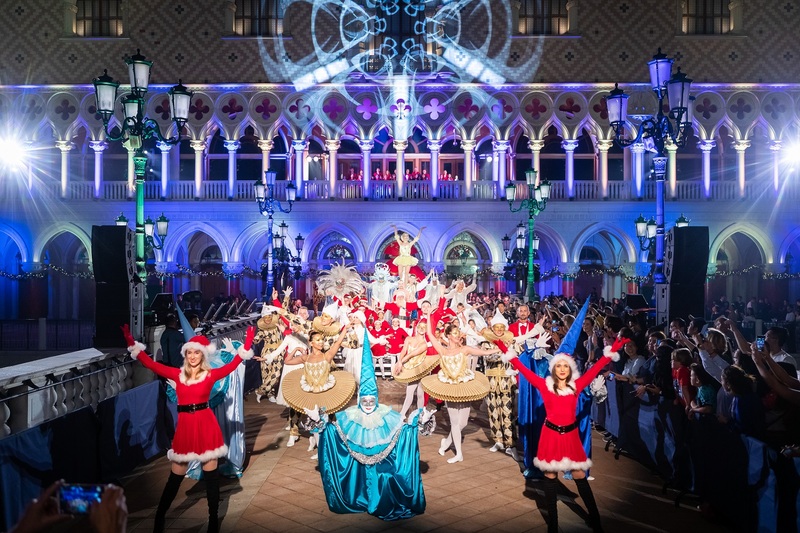 Photo caption:Sands Resorts Macao launched its Winter Extravaganza programme in Macao yesterday with a Christmas themed parade and entertainment. Festivities are open to the public until Jan. 6, 2019, including a genuine ice skating rink, Christmas markets, entertainment and more. 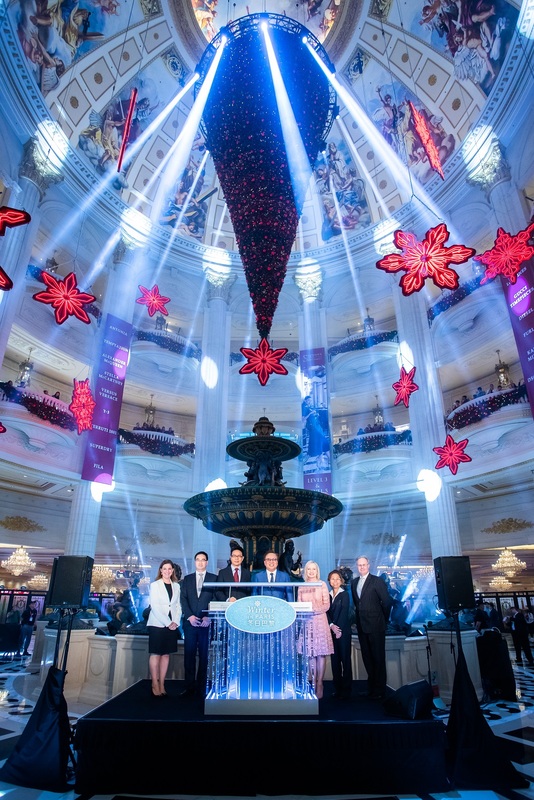 Photo caption: At The Parisian Macao lobby rotunda, Dr. Wilfred Wong, President of Sands China Ltd. and Mr. Cheng Wai Tong, Deputy Director of the Macao Government Tourism Office, along with senior executives, unveiled a stunning 50-foot inverted Christmas tree, accompanied by a festive children’s choir. 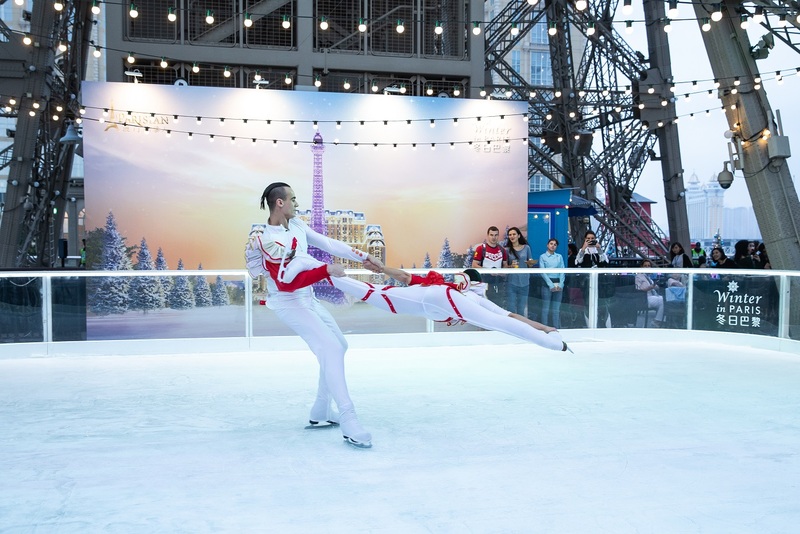 Photo caption: Visitors to Winter in Paris at The Parisian Macao can enjoy festive decorations and a real ice skating rink at The Eiffel Tower Level 7 observation deck until Jan. 6, 2019. 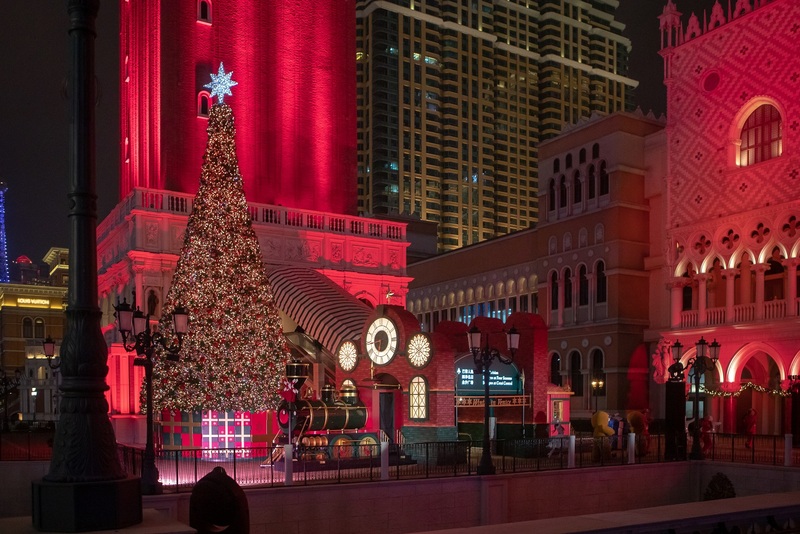 Photo caption:The festive season was kicked off at The Venetian Macao’s lagoon area with the unveiling of a 50-foot tree and Winter in Venice decorations, including the beautiful Christmas train ‘The Venetian Express’. 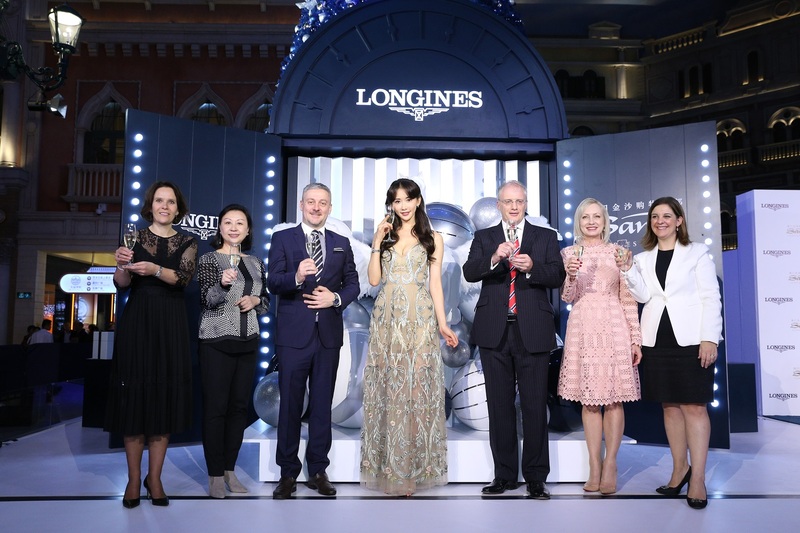 Photo caption:At St. Mark’s Square at Shoppes at Venetian the unveiling ceremony of the Longines Christmas tree was officiated by actress and Longines Ambassador of Elegance Ms. Chiling Lin alongside Sands China Ltd., Swatch Group and Longines executives.